Masterton tattoo artist Raine Mackenzie knows the struggle of losing a best friend to suicide. And it was through her art form that she has been able to lift herself out of some dark times – “it ultimately saved my life”, she said. 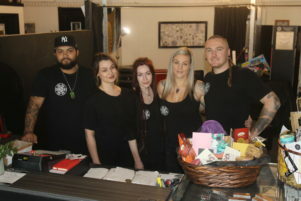 Now, with her colleagues at Sacred Art Tattoo & Piercing in Masterton, Raine will use her art to bring healing to other Wairarapa people bereaved by suicide or affected by mental illness. 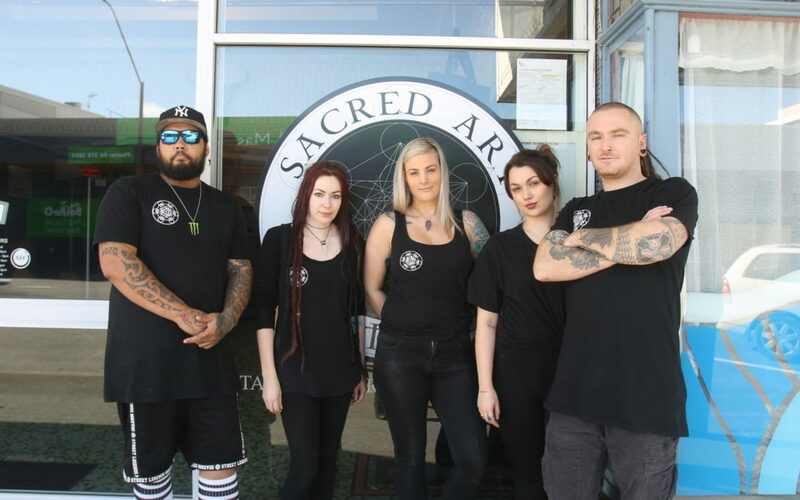 Sacred Art, which is hosting a suicide awareness event on September 15, will be offering discounted ‘flash’ tattoos, donating 65 per cent of the cost to local mental health charity Suicide Awareness Matters. There will also be discounts on tattoos commissioned to cover self-harm scars, a bake sale, raffle, barbecue and a guided meditation with koha entry. “For me, tattooing has always been something quite sacred,” Raine said. Raine lost her best friend to suicide last year. “The main thing I realised when I lost her was that, there’s just so much love that comes with grief and it’s a crazy experience. “I feel like it is really easy to become divided when you are in a bad place of mental health. She said the suicide awareness fundraiser would be a means to “bring people together that have all gone through the same thing”. Sacred Art owners Sarah and Jordan Tredray said the event meant a lot to them, their staff and the wider Wairarapa community. “We’ve had a lot of people who are very close to us that have gone through the grieving side of suicide,” Sarah said. Provisional suicide statistics show that between July 2016 and June 2017, 12 people died by suicide in Wairarapa, giving the region the second highest suicide rate in New Zealand, behind West Coast DHB. Sarah said she had suffered with depression and suicidal thoughts for “what feels like my whole life”. “I have been that low where I have attempted to take my own life – and I know how lonely it can feel. “I worry for my children and young people around us that there isn’t enough of a support net around them to help them back out of the hole if they end up there. “If we talk about [suicide] and make it okay to talk about, then hopefully that is the first step in saving the people around us. She said she was inspired to create the event after seeing Raine grieve for her friend. “The heartache and effect it has on those left behind is devastating. Sarah’s husband Jordan said he had also seen the effect on people after losing a loved one to suicide – “they have been thrusted into a shocking reality that changes their life”. “There is a huge deep hole that people go through after a loved one dies. The Wairarapa mental health charity which Sacred Art is fundraising for is Suicide Awareness Matters, which can be abbreviated to SAM. It is spearheaded by Masterton mother Toni Ryan, who lost her teenaged son Sam to suicide in 2011. Since then, she has made it her mission to learn as much as she can about mental illness and the other contributing factors that have produced high suicide rates in New Zealand, and especially Wairarapa. She hopes her work will empower people to understand mental illness, reduce suicides, and prevent further heartbreak for families. “I just feel epically proud that our community is willing to come together like this – that’s when the real change starts to happen,” Toni said. Toni said her son Sam was “a remarkable young man”. “His behaviour in the last two years leading up to his death . . . that wasn’t my son – that was the illness having an effect on my son. She said people tended to blame those who had ended their own lives – “that they were weak – or in Sam’s case, that he was a useless druggie, doing this that and the other”. “Well he wasn’t – he was a remarkable young man who was always there when his friends wanted to talk – he was the most polite kid in the whole universe. Toni said the community needed to understand that if they chose to become empowered by learning about mental illness, “they can make such a profound difference”. “I have spoken to thousands of people who have lost children, husbands, wives, sisters, brothers. “Every single person I have spoken to loved that person who they lost. “We’re not losing numbers, we’re losing people. For more information about Sacred Art’s suicide awareness fundraiser, visit their Facebook page, Sacred Art Tattoo & Piercing. The event is at their Queen St shop on Saturday, September 15, from 10am until 3pm with a guided meditation at 6pm. Tickets for the raffle (total prizes worth $3500) can be purchased at the store for $5 each.